After the success of their first branded black cab in Manchester, ChoiceQuote have introduced a second branded taxi to the streets of Manchester. 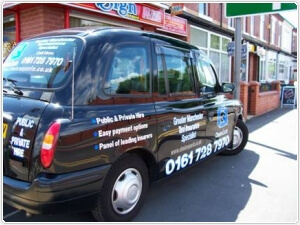 The cab will be based around Manchester International Airport and Manchester City Centre and will help to futher increase awareness of ChoiceQuotes taxi insurance products. Other ChoiceQuote branded cabs are now planned for the Liverpool and surrounding areas. ChoiceQuote have highly competitive taxi insurance and minicab insurance rates for the Greater Manchester area and for both public hire and private hire taxi drivers. Other add on products are also available such as public liability cover, personal accident cover, protected No Claims Bonus, and uninsured loss recovery.